At one point or the other of your business life, you may be confused about the terms- independent contractor and employee. Any business has two options when it comes to getting their work done. They can either hire an employee or work with an independent contractor. There are so many differences between the independent contractor and employee that you have to pay attention to. Let’s take an example of a software developer, your company needs to get software developed and are searching for a suitable person to do it. There are so many freelancers out there who offer the development services or you can hire an employee for the development. Either way, the software will be developed, it is important for you to decide who is more reliable. 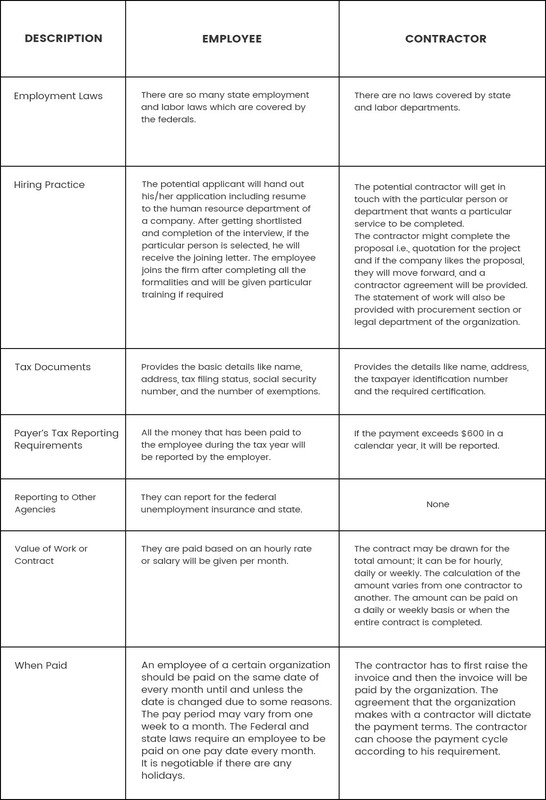 Below image shows the quick differences between hiring an independent contractor and the employee. If you hire resources for your company on a salary basis, the person is bound to obey the rules and regulations of the company. He/she will stay loyal to the organization and offer their full-time services for your company only. They won’t spend their office time on any other projects other than yours. This will provide you with a feel of obtaining personalized services. The loyalty of an employee results in more productivity. The staff will help in the growth of the company and they even aid the company when needed. Like your commitment to the work, the staff will also stay committed and offer you with the services. A business can take a turn at any time and it is important to have staff that can back you up. An employee will always come in handy whenever the company is facing any tough situation. They will provide their support and will work on more than one project if needed. If you have multiple software to develop, the developer you hire will aid you in the process and will dedicate a good amount of his time in offering the solutions for your organization only. If your organization is small, then you need staff that can perform various roles. The developer isn’t only confined to the development of software, but he/she will also help in the project management or any other extra work that you need. The developer will take care of some other works that needed some monitoring. This way the employee will help the organization to grow. The employer will have the complete control over the employee when he/she is in the organization. You will be able to decide which tools they have to use in the development process when to work on the project, when not to, etc. you will be able to monitor and track the employee all the time. When it comes to an independent contractor, you have to follow up with the person from time to time to know about the updates of work. You should put in some efforts to know how the project is going. As the person is an independent contractor, you have to be alert all the time when you are working with him and there is no assurance of quality of the product that he/she finally delivers you. You may find a good independent contractor but the contractor charges different amounts for different projects. This may become burdensome for you. As the contractor is bound to arrange tools and all the other required products, they charge you the amount including all these costs. These charges will vary from time to time and you may have to pay more amounts at times. The office employees are more flexible. They will be available for you all the time during the working hours. You can ask these employees to help you with various other tasks. But the situation is different with the independent contractor. The person operates as a single entity and he works with so many other organizations too. This may lead to some of the issues on your part. They won’t be available all the time for the meetings and some other discussions and you are not liable to say them how to get the work done. All you can do is assigning the project and imposing a deadline. Bob run his own business and he needs mobile app development for his business app. He hired an independent contractor and explain to him the requirement of his restaurant app project. During the project, when he notices the performance of the project is decreased and also the developer did not answer him at the exact time. The developer says that he will not always available because he has also another project for the development. After that, Bob has decided to hire employee developer for his project. He notices that the company regularly give updated him for the project progress and also available on the time on which bob want to contact them. Finally, he has been completed his project into the timeline with desired results. 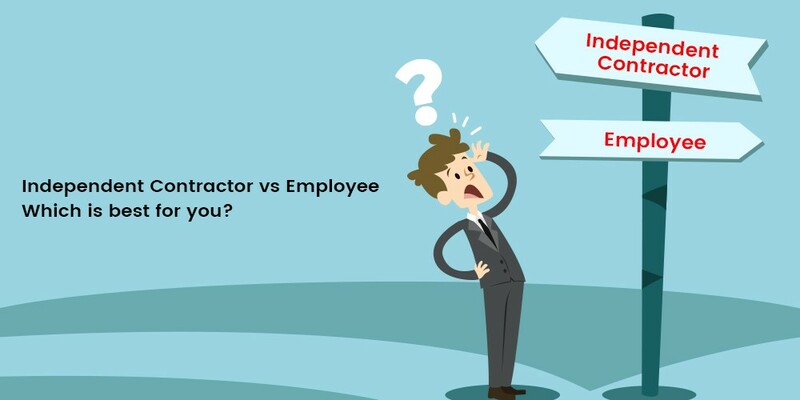 Why Hiring an Employee over Independent Contractor is better? When you hire an employee, you personally get a chance to assess the person and hire them. This way you will understand the skills of the employee and you can train them with the skills that you want them to learn. But the situation is different with the independent contractor. You won’t be able to understand the person specifically. The contractor has complete freedom of the work and he/she can decide how to work, where to work and when to work. They won’t abide by any rules and regulations that you set for the work. You won’t be able to monitor them, and they will just present you with the work when it is completed. This way you won’t have any control over the project. These people aren’t flexible enough to spend their time with you whenever necessary. As they work on multiple projects at once, they won’t be able to meet up with the clients whenever necessary. The business relationship with an independent contractor and employee is very different. There are both professional and unprofessional independent contractors out there and hiring one of them may lead to great or disastrous results. But if you hire an employee for your organization, you can train the employee as per the company’s requirement and assign them with the required tasks. These contractors aren’t bound to work only for your organization, and they may engage with other employers as well. This may lessen the quality of work they produce. There are so many such issues that the companies struggle due to the independent contractors. Another issue that the companies face with independent contractors is that they can subcontract the work to other parties. Yes, this happens. There is a plethora of situations where the independent contractors have assigned their work to the third-party person. The work quality may decrease as the work has been delegated to the third-party. So, if you want to have a steady workflow and monitor the employees with the project from time to time then the best way is to hire an employee. The employee can become an asset for your organization whereas the contractor just gets the job done, takes the payment and vanish. Myself Mrudul shah CTO at Technostacks infotech helping the team to adopt new technologies, interests in learning and sharing IT technology news trends.